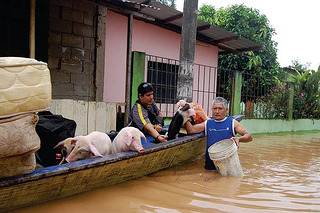 Casualties from severe floods in Peru have now risen to 106 dead and 364 wounded people, while the number forced from their homes has reached 156,400 as heavy rains continue across many areas of the country. The worst rain to hit Peru in two decades has caused catastrophic floods and landslides, sweeping away homes and vehicles as rivers burst their banks and roads collapsed off hillsides. Peru’s authorities are now reporting that 1.1 million people have been affected by the disaster, of whom over a third are children. Torrents of mud, boulders and uprooted trees ripping into towns, villages and agricultural land across Peru have left 211,000 homes, 1700 schools and 592 health centres damaged or destroyed, and 54,000 hectares of farmland devastated. Caritas Peru has so far collected 595 tonnes of humanitarian aid which is being distributed urgently throughout the affected dioceses. Caritas reports that the disaster has hit 24 out of 25 districts in the country. A state of national emergency has been declared in the worst-hit region of Piura, where 318,000 people are affected. The country’s infrastructure has suffered a severe impact from the torrential rain and mudslides, with 258 bridges down and 6000 km of highways damaged, plus a further 10,000 km of rural roads. Food prices are rising steeply due to road blockages. The local and international appeal launched by Caritas Peru together with the country’s largest media outlet RPP has so far reached 49,000 people with humanitarian aid distributed through the diocesan Caritas networks in Chosica, Cañete, Ica, Arequipa, Chulucanas, Piura-Tumbes, Chiclayo, Chimbote, Lurín and Trujillo. Caritas Peru is coordinating across eight dioceses in areas where a state of emergency has been declared, delivering both funds and supplies. The damage to roads and highways is making access difficult, so Caritas is moving some aid via airlift and sea to reach affected populations. 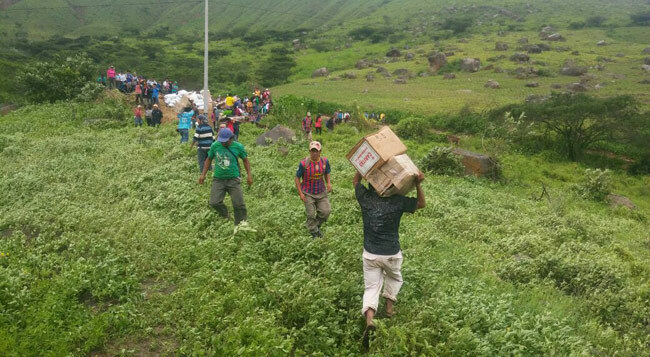 On 4 April Caritas Trujillo reached inaccessible areas with the aid of three military helicopters; due to bad weather they were unable to land but essential supplies of food and water were successfully dropped, reaching 160 stranded families. “Nothing can stop us from getting this help to where it’s needed,” says Caritas Peru. Caritas Chimbote also used helicopters to get help to 200 families, while Caritas Piura is reaching 1,070 families with emergency supplies including clean water, food, clothes and nappies, first aid kits, tools and roofing sheets. Even animal feed must be distributed by the aid agencies, with many thousands of livestock at risk. Caritas Spain and Caritas Bolivia have launched public appeals for victims of the Peru floods, and Caritas Germany has sent an initial sum of €100,000 for relief and reconstruction. Meanwhile 2,000 people attended a special ‘Solidarity Symphony’ in Lima performed by a children’s orchestra and supported by Caritas Peru and other local organisations to raise funds. “We are really grateful for the solidarity shown by Peruvian volunteers and by the international Caritas family,” say Caritas Peru. While in places flood waters have reached neck height, just a few months ago Peru was suffering from widespread drought and record wildfires. The dramatic swing is being attributed to a ‘coastal El Niño’, a weather phenomenon exacerbated by unusually warm temperatures in the waters off Peru’s Pacific coast.